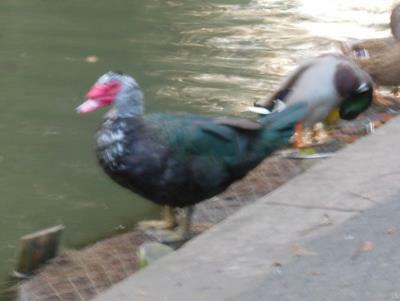 Bird Id - Forum - Identifying Birds - Not A Blueish-black Water Bird, But A Black And Green One. Forum > Identifying Birds > Not A Blueish-black Water Bird, But A Black And Green One. The bird is black with a green back or wings and a distinctive stepped beak. 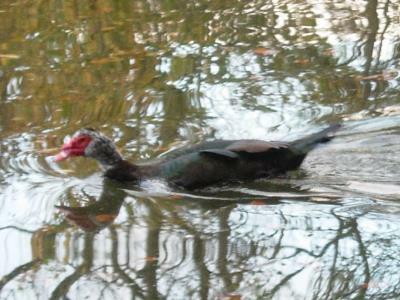 It has webbed feet so can't be a purple swamphen. Its size is about half way between a mallard and a mute swan - one of the attached pictures has a mallard next to it for comparison. As you can see from the photos on that webpage, the colouration around the head, beak and neck varies between individuals, as does the size of the step on the beak.